One of the common cliches regarding Japanese cities is how futuristic they look. A step into 2030 blah blah... Well we must not be seeing the same cities. While all Japanese cities have some very modern districts, mostly they're just a sprawl of ugly low-rise buildings covered in neon. And as far as I know, neon hasn't looked futuristic in at least 25 years. But I digress. 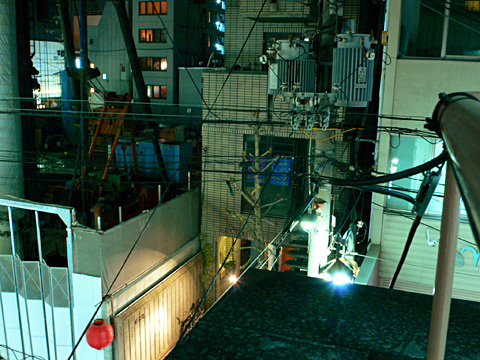 The really striking thing about Japanese cities is that, as in developing countries, electric wires are not buried but just hung up above the streets. So when you're walking the city, it's always with a mess of electric wires overhead. It takes some time getting used to but for Japanese people, it is such an habitual sight that when you ask them why they don't bury the wires, they just look at you with a blank stare that says, "but what for??". It is quite paradoxical, considering how much Japanese people love and admire European cities, that they don't see the point in making their own cities beautiful. The Japanese approach to architecture seems to be mostly utilitarian: build fast, cheap, and functional. It used to puzzle me to no end: the Japanese are design addicts who love quality products with a perfect finish and have an obsession for detail, so why don't they mind living in ugly cities where electric wires loom over the streets? That paradox has a name: it's the "uchi and soto" paradigm. "Uchi" means "my house", "at home", or sometimes "I". "Soto" is "outside, exterior". The Japanese feel uchi when they are with members of their group, in a familiar environment, or in places where they can relax; they feel soto in any other setting: with strangers, in open public places, or anytime they can't be themselves. According to this paradigm, being in a uchi or soto setting conditions the whole behaviour of Japanese people as well as how they feel about their surroundings. In an uchi setting, they are warm-hearted, relaxed, and enjoy life. In a soto setting, they "don the armor": they are distant and inexpressive, never let their guard down, and enjoying life is the furthest thing from their mind. So for example, if a Japanese has lunch with a new business acquaintance, they will stay very formal, ask few questions, and barely enjoy the food. Talk about awkward! But on the other hand, friends having lunch together generally laugh and giggle with less reserve than you'd find in the West. They don't look inscrutable then! So, next time the Japanese puzzle you, the uchi and soto paradigm might help you make sense of their behaviour. In the meantime, just a quick disclaimer: Japan has some amazing architects, and when the Japanese bother to try and make a part of the city look nice, it looks really great. Too bad it doesn't happen very often... The ugly wires are here to stay.